Geek Fashion Week is Coming! While we’ve seen companies and blogs make use of the term “geek fashion week” in the last year or two to celebrate specific products or geek fashion in general, this year we finally see an actual Geek Fashion Week event! How exciting! 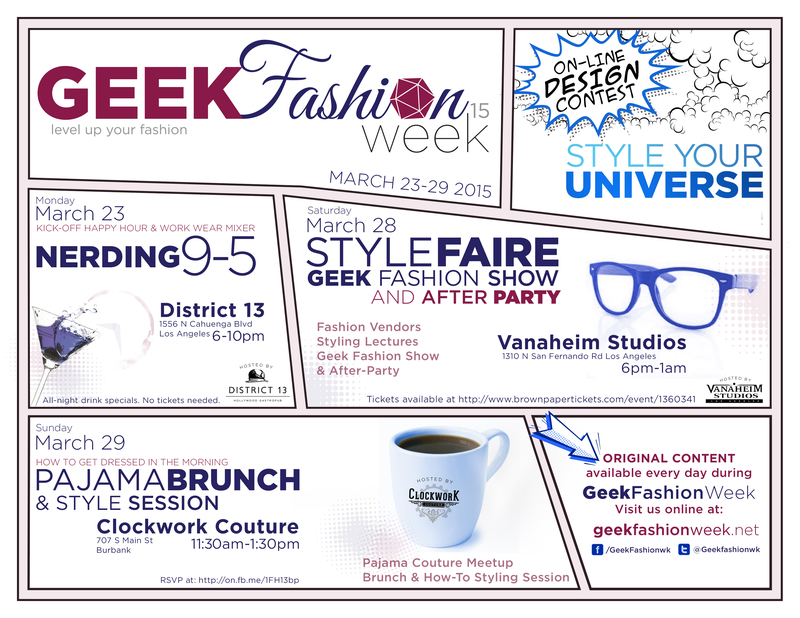 Hosted simultaneously online and in L.A. the week of March 23rd – 29th, Geek Fashion Week is the brainchild of friend and fellow geek fashionista Dina Kampmeyer, along with a team of other fashionably amazing geeks. It’s time to level up your fashion. Backed with sponsorships from powerhouse geek staples like Her Universe, Espionage Cosmetics, and ThinkGeek, Geek Fashion Week is an event not to be missed if you’re interested in geek fashion, or would like to learn more about how to style and incorporate geek into your existing wardrobe looks. There’s something to be had for everyone, from the Style Your Universe online design contest, to the Style Faire hosted by Vanaheim Studios in Los Angeles that will feature a geek fashion show, vendors, and lectures! We’re particularly in love with that online style contest (sponsored by Her Universe), and can’t wait to see what looks everyone comes up with. You’ll be sure to see us at the Style Faire, and hopefully that Pajama Brunch too! Which event or topic that the Geek Fashion Show is offering are you most excited about? What would you like to see them include in their plans for next year? Be sure to follow them on GeekFashionWeek.Net, and on Facebook. Aside from the actual Geek Fashion Week they’re running, they regularly blog about the actual fashion seen in shows like Arrow and The Flash, and where you can actually get it.